And, liked I mentioned, prepare and cook these clams were simple. Most of the times, we cooked this seafood in pasta dishes and Miso soup. Stir frying with chili was a common way to cook, too. I personally liked chili clams, in gravy kind. Just like the chili crabs which famously known as local delicacies of Singapore and Malaysia. This recipe is not exactly spicy, but more like a blend of chili and tomato flavour mixed in egg drops gravy, and the flavour of this dish was so great that we would usually dip dinner roll, fried or steamed bun (mantou) in its flavoursome leftover gravy. Yummy! Well, even without the buns, go with hot steamed rice would be equally tasty and fulfilling. 1) Wash and soak clams in clean salted water for 30 minutes. Rinse and set aside. 2) Heat a large wok with oil over medium fire. Add garlic and ginger, fry till fragrant. Add clams, and stir fry for 3 minutes. 3) Add tomato sauce, chili sauce, light soy sauce and water. Stir fry for 5 minutes. Add vinegar, and sugar. Continue to stir fry for another 5 minutes, until all well-combined. 4) Reduce heat to low fire, cover with lid for 3 minutes, or until almost all clam shells are opened. Break eggs into a small bowl, briefly beat the eggs. Then, stir in egg to form egg drop. 5) Lastly, stir in corn starch slurry to thicken the sauce. Heat off. Place lettuce leaf on a large serving dish before placing clams on it. Serve immediately with rice or steamed/ fried buns. Calories of a decent portion (a palm-sized) of clam counts about 220kcal. Not too high calorie in clam itself actually. It is the sauce that goes with it counts (smiling). Cooking time is just less than 30 minutes, excluding clams soaking time. Soak clams while cooking other dishes, and then, return to the clams and cook it a fast one! Tips: Do not over-cook the clams. It’s cooked once shells are opened. Hence, eliminate the lid covering step, if they are cooked. Claim meat will shrink and harden, if overly cooked. 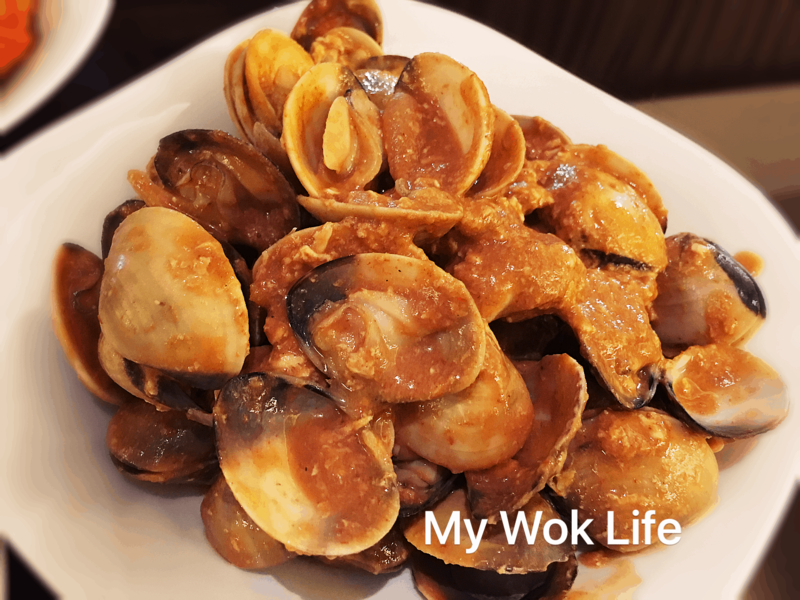 * You may also try to combine all condiments beforehand, mix all condiments in a smal bowl before adding into the wok instead of adding them in one-by-one. * Add more water if more gravy preferred. * Ingredient measurement of cup – refers to (standard) regular-sized drinking mug with height of about 4″ and diameter of 3″. ← Disney naturally, Food & Fun Place for your Family and Kids! Oooo this dish is one of my faves too! I think clams are easy to make at home. Yay to that. I welcome you.. 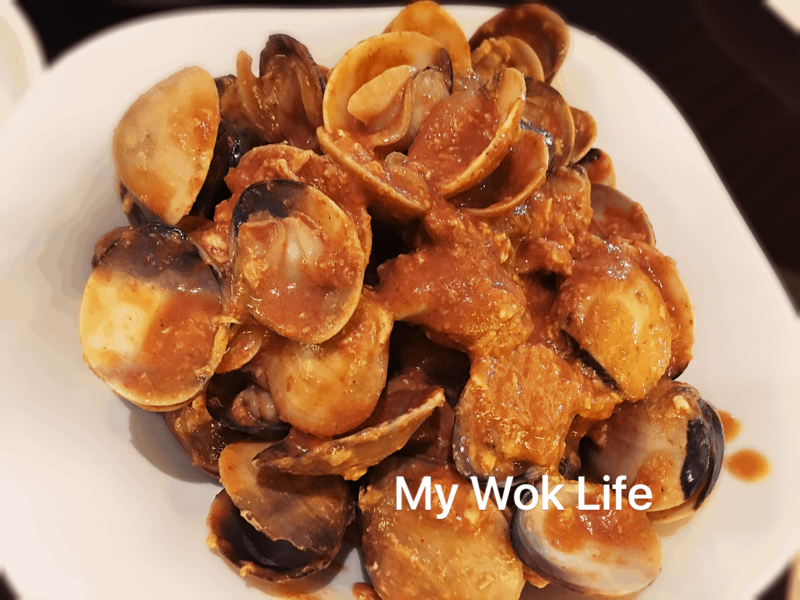 I have another clam recipe in curry… Share with you again..
May I ask what kind of chilli sauce do you use? Can I use Chilli Oil mixture? Chilli oil might not taste right..